FOUL DEEDS & SUSPICIOUS DEATHS IN & AROUND CHESTERFIELD. Softcover. Medieval worshippers hacked to death in the sacred precincts of Chesterfield parish church, better known for its Crooked Spire. A farmer shot dead from ambush in mistake for someone else while on his way home from market on Friday, the Thirteenth. A failed suicide from the cliffs of Stoney Middleton and a successful one in the Falcon Inn at Chesterfield, robbery and murder in the remote fastness of Winnats Pass, wives killed by brutal husbands. Desperate hand-to-hand battles between Victorian police officers and livestock rustlers. Plots against the government in Tudor and Georgian times, and a gun-toting robber gang of the late Stuart age. 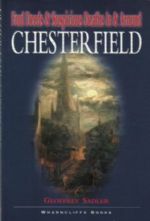 These are some of the many crimes covering a period from the Middle Ages to the late Victorian period, which show all too plainly that cruelty and greed have been a danger to life in Chesterfield and North Derbyshire throughout the ages. A book presenting Derbyshire's darker past which combines detailed research with a lively insight into characters and events. Illus., Index. 160pp. trade size softcover. From the library of true crime writer, Wilfred Gregg, with his personal b/plate. F. with no creasing to covers.